One of the perks of being acquainted with veterans of the wargaming hobby is that they often have stack upon stack of unopened boxes of miniatures, hidden away more or less succesfully from the eyes of their oft disapproving spouses. My friend Henk, then, was happy enough to force several boxes of plastic Perry ACW models onto me – in return I’ll be painting up some Prussian Landwehr for him, more on those later. 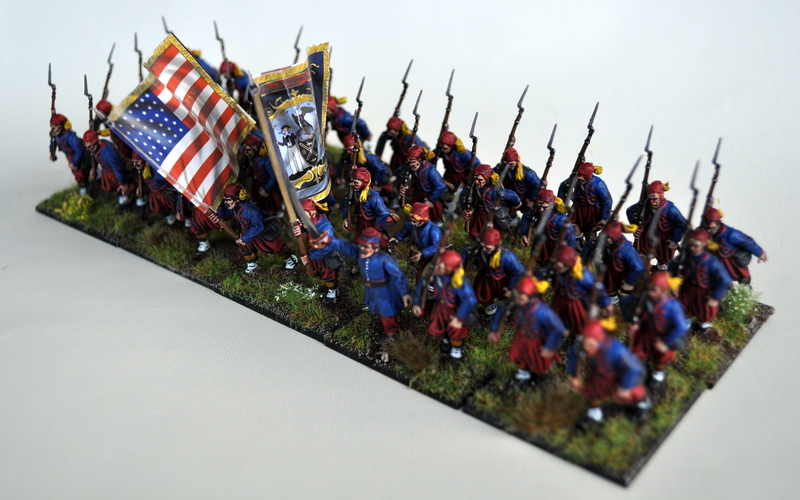 The first batch of Union troops is what I’ll be showcasing today. The Perry’s first plastic set. They look dated, but only when compared to their newer plastics. As with most uniformed models I’ve been painting recently, I started off with an undercoat of macragge blue, followed by a block paint of the trousers in lothern blue which was drybrushed blue horror followed by praxeti white. The coats were drybrushed caledor sky and then the entirety of the models was washed drakenhof nightshade – a nice deep blue. I’m quite happy with how the trousers’ colour came out. Other than that, it was straightforward work with the same colours I use for flesh, metal, wood, leather and the like. No radical changes there, as I’m keen on making good progress on this project. One area I did spend a bit more time on was the blankets wrapped around some of the models. These I painted mostly with muted colours, though I did add some brighter ones and a pattern here and there to lighten the unit up. As you can guess from the bases of the unit, it’s incomplete – I’m building my ACW units fourty strong, so I still have half to do. For this reason I’m also leaving the basing to be done in one go at the end. That’s it for today – more Crusaders are just over the horizon and should feature on the blog later this week. Until then! 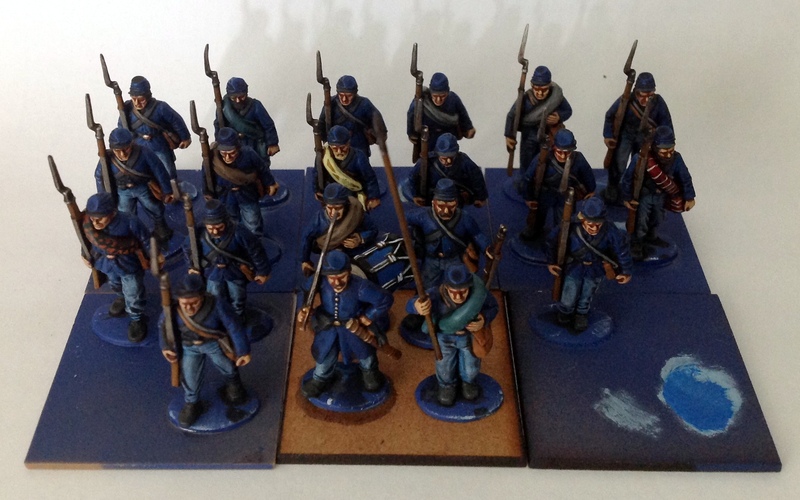 A while back I was given part of a box of Perry ACW cavalry as part of a payment for commission painting. 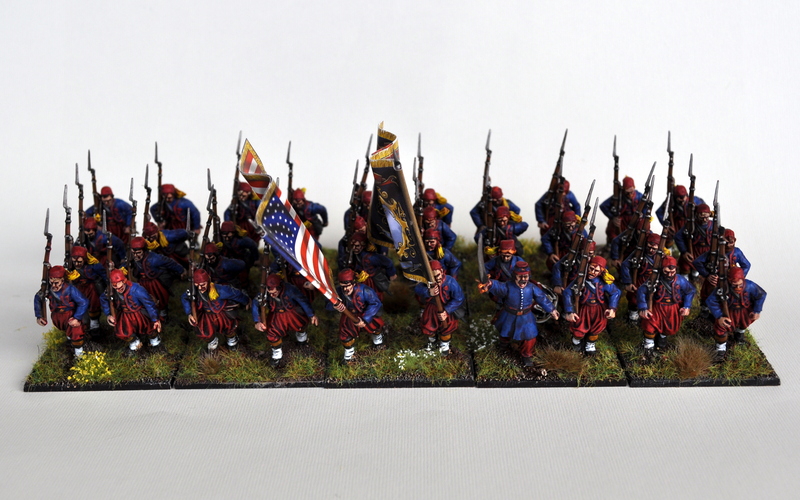 As with the Zouaves I painted recently, I wanted to curb the backlog for this project as much as possible, and so here they are. On this unit I tried out another of GW’s recent colour spray cans, namely guilliman blue (or girly man blue, if you play Ultramarines). 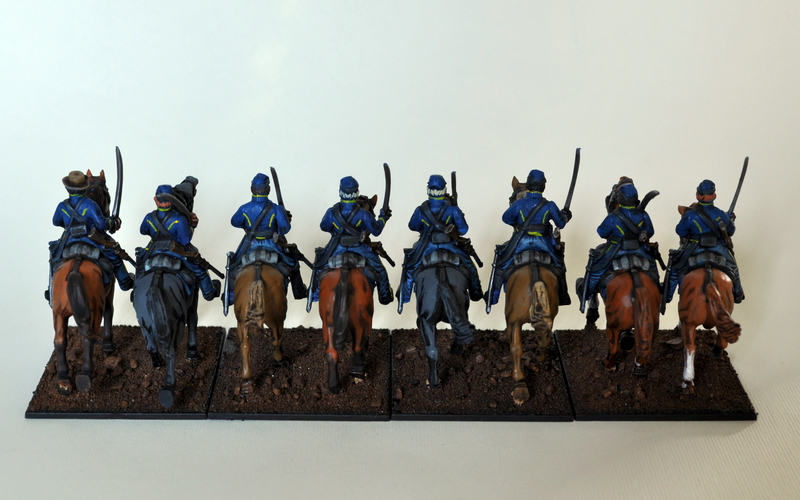 The horses were basecoated black, but the riders received this blue undercoat. The jackets were then drybrushed caledor sky, and the trousers were drybrushed lothern blue then blue horror, before the riders received a drakenhof nightshade wash. All other areas were handled as I tend to handle them. The yellow piping was a nightmare to get right, of course. Still, that’s them done. I’ll be looking to expand somewhat on this fledgling ACW collection in 2015, at which point this unit will be doubled in size, complete with a horse holder and dismounted cavalrymen. Thank God the Perrys have a wonderful range for these guys. 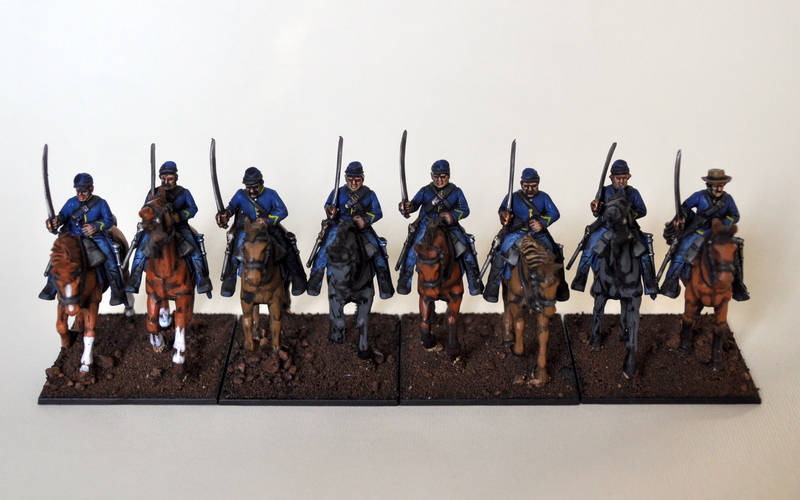 Stay tuned as I have another batch of cavalry charging onto the blog tomorrow. Yee-haw. 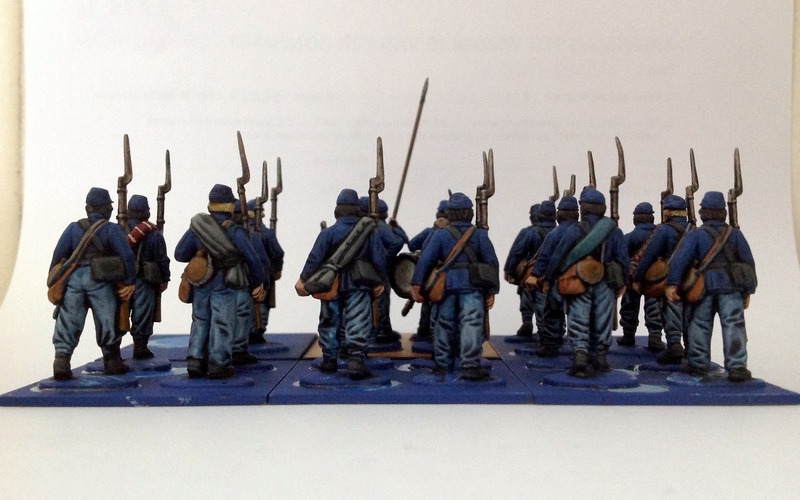 I said I wasn’t going to start any new projects in 2014, but that’s before the guys I frequently paint models for started to recompense me with leftover boxes of Perry Miniatures ACW. Just one and a half boxes for now; the contents of the one box is what we’ll be looking at today. Being a brand new project I wanted to get these out of the way as soon as possible, in order not to be distracted from my many other armies. Speedpainting isn’t exactly my kind of thing, but this unit is the closest I’ve ever come to it. Let’s take a gander! I painted these guys in two batches of twenty models – it’s been a long time since I’ve painted this many in one go. The models were undercoated with my mephiston red spray – really handy, this one – then drybrushed with wild rider red, before caledor sky was applied to all blue areas. Then, the models were washed all over with druchii violet. Simple! A massive block, this one. After that, all black areas were basecoated adeptus battlegrey then shaded with nuln oil – a really easy way of doing black – and the wood bits, straps and yellow parts were basecoated in xv-88, rakarth flesh and averland sunset respectively before receiving an agrax earthshade wash. The skin was even easier – I just applied stark highlights with kislev flesh, not even bothering with an undercoat. Super easy and enough for tabletop quality! That’s it for now! I have one zouave left in my box which might be the subject of a painting tutorial in the future, but for now I’m off to give other units in my backlog some love. ACW-wise I have eight cavalrymen left which I might be doing up soonish, so stay tuned!